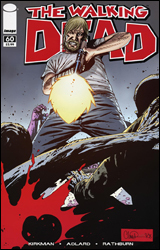 While on the surface it seems to be a run-of-the-mill zombie book, The Walking Dead has developed into one of Image's longest running, most highly regarded comics. As the weeks of scarce survival have turned into months and years, the title's cast – helmed by a small-town police officer named Rick Grimes – has been through its ups and downs. Pained by the brutal longevity of the situation and the constant menace of a surprise attack, the rag-tag cluster of survivors are beginning to find that despair and hysteria may prove to be bigger threats than the zombies themselves. I won't lie – this is my first look at the guts of Walking Dead. I've had the first trade on my to-do list for almost a year now, but keep finding reasons to hold off purchasing it. So, to say I found the idea of starting with issue number sixty intimidating may be something of an understatement. Sometimes that feet-first dive is just what it takes to really spark an interest, though, and I'm pleased to report that's precisely the case here. I found Robert Kirkman's writing astonishingly accessible; it's easy to understand without a lot of back-story (really, the title of the series was enough) and constantly gripping. It's obvious there's more to this situation than meets the eye, but that additional, undefined depth actually adds to the experience, rather than putting me off with a big chunk of weighty overhead. Although this is the final issue of a five-part story arc, I didn't need a lot more direction than "there's a herd of zombies on the horizon." A great deal of the issue is spent on a mad dash for survival, but Kirkman is still able to sneak in a few powerful moments of characterization and genuine drama. It's an excellent blend. Providing Walking Dead with its artwork since its second story arc, Charlie Adlard is more than just a familiar face at this point. He brings just as much vigor to each character as the writing, adding an untold extra chapter to each survivor's story with every scrape, bandage or bruise. The decision to go black and white full-time means Adlard's readers will be asking more of his compositions, criticizing his decisions in more detail, but the artist blossoms under that added responsibility. Without the crutch of colorization to lean on, he's more daring with his shading and more cinematic in his approach. This actually feels just like a Night of the Living Dead-era screamer, which does more than I can say to put its readers in the right mood for the story that's being told. The Walking Dead is a rarity: a match of writer and artist that fits together like mind and body. They're a perfect fit, and so is the story they've set out to tell. There's enough depth here to keep familiar readers banging on the door each month, but also an amazing focus on accessibility to ensure curious new readers don't throw it away after the second continuity-soaked page. I'm done waiting, this is going on my pull list right away – I can catch up with the back-issues at my own leisure. Highest recommendation to buy.